Here is the solution to display the full path in the title bar of Windows 8.1 or Win 8 ms-explorer! Start the Windows 8.1 MS-Explorer (eg keyboard shortcut [Windows + E])! In the Explorer Folder Options window is now open, please select the View tab. Pressing the Apply button (... see Image-1 Arrow-5) to shown the full path in the Windows-8.1 Explorer title bar. (Image-1) Display the full path in Windows 8.1 ms-explorer title bar! However, you can use this example, as a solution to see the full path in the title bar of Windows ms-explorer, without hesitation and disadvantages on older versions of Microsoft's Windows operating systemsto see the full path in the title of MS File-Explorer whether it's a Windows desktop, tablet, Surface Pro / Go, or even a server operating system. It has been tested on all and successfully verified. It is sometimes necessary to see the Full Path at File Managmend! Windows-8 - FAQ-158: Display the full path in the title bar of Win 8.1 ms-explorer! 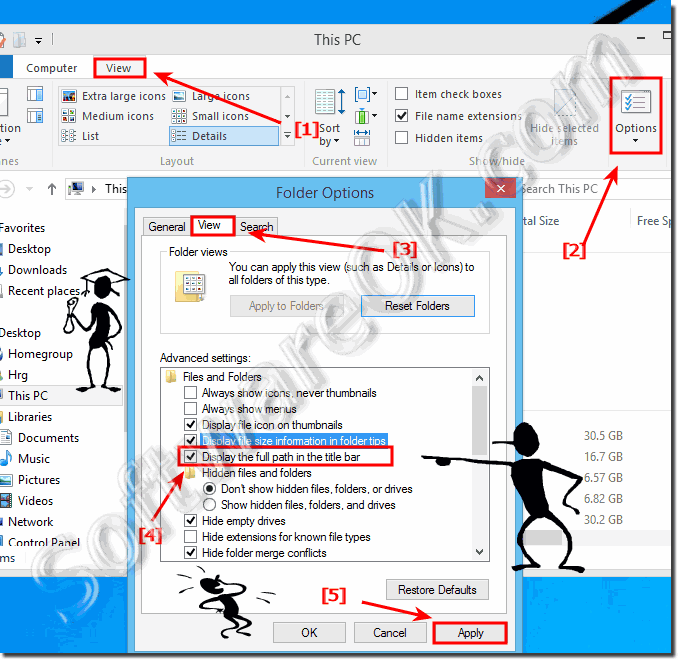 Windows 8.1 how to display files complete path? What displays in the title bar in windows 8? Explorer windows 8.1 path tab?